I'm getting mentally ready to start Body for Life in 2 weeks. 2 weeks and not now because I have the GRE coming up and don't need to focus on both! But that doesn't mean I can't start a light version. That's the iphone user in me -- there's Body for Life and Body for Life Light version. If you've ever downloaded an app you know what I mean, if not get with it! Geez. I love my iphone! Tonight's dinner was adapted from a recipe Aunt o' Mine (AoM) sent me a few years ago. I've made this different every time and every single time it turns out soo yummy and is incredibly easy to make. 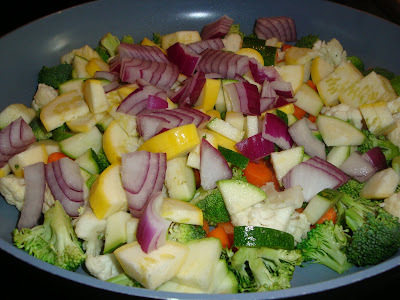 Start out cutting up and sauteeing your favorite veggies. 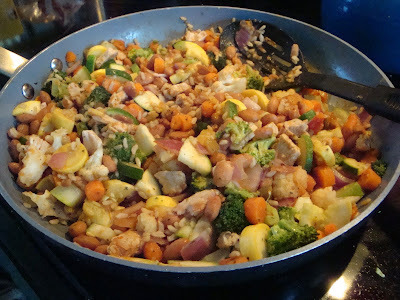 I used broccoli, cauliflower, carrots, yellow and green squash, and a red onion. Saute for about 8 minutes or until it's to your liking. Season it up with your favorite seasonings. I used McCormick All Purpose Salt Free Seasoning, garlic powder, and a little sea salt. Then throw in a cup of cooked brown rice, a can of pinto beans, and about a half cup of salsa. I had some premade turkey breast in the fridge so I threw that in too. Simplest dinner you'll ever make and believe me, sooo good! And good for you makes it even better! Hope you try it out and love it as much as we do! Saute garlic, scallion, jalapeno, carrot, red and green peppers, and snow peas in olive oil. Add salt and pepper and a cup of cooked brown rice. Add 2 or 3 handfuls of fresh spinach and a cup of salsa. Spoon into plastic container, add a few chunks of cheddar cheese which will melt from the heat. Throw in some sliced avocado if you have it. I stumbled upon your blog via the foodie blog roll. Welcome to the blog roll. 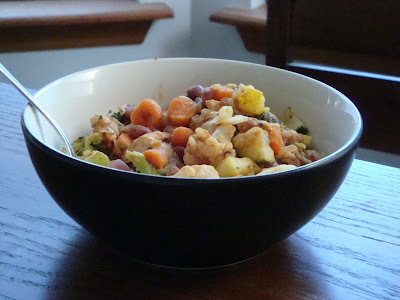 This recipe looks looks great and just like the types of things I make - I love throwing my fave things/whatevers around in a bowl together. Check out my and my friend's blog too!